Have you ever had to leave a place you just loved being in? We have and just did. Madrid, Spain, to be exact. A couple of years ago, we decided to move to Spain, and we loved it so much that just after one year we decided to stay another year. So what makes Madrid so lovable for us? There are many things. The high quality of life at a much lower cost (compared to New York City). The access to the rest of Europe via Spain’s central hub. The incredibly fast growing vegan food scene that shows no signs of stopping. That eating out and socializing are practically synonymous AND includes all ages. The excellent public transportation with reliability and cleanliness that puts NYC to shame. The endlessly sunny weather and mild winters. The priority on preserving history and allowing public access to refurbished buildings reused as public art spaces (see more in our guidebook on alternative site seeing). The thriving alternative art and lifestyle scene – street art and tattoos/ piercings abound. The list goes on. So hold up a second – why would anyone leave such a stellar city? Simply put, our life/long-term goals have shifted. Much like the perspective in this photo. We originally came to Madrid for many reasons, including but not exclusively: language learning (Spanish), a steady job, affordable cost of living, and an escape from the concrete clutches of New York City. We had started this blog about six months before moving to Spain, but otherwise, we hadn’t committed to any specific goals. And since achieving these ends after two years in Madrid, well, life has happened. Veren’s job teaching English has been great and fairly easy. Sam has had a comfortable sun-flooded home to work remotely in. We were able to go out a few times a week as we had more free time and going out is more affordable in Spain. Life was full of little surprises and a steady stream of newness – all around pleasant as foreigners in another country’s capital city. Yet within the past year (our second in Madrid), what we wanted out of our allotted time had begun to change. The seed of change was planted in December of 2016, well before its early 2018 blossoming (check out our 2017 Year in Review for more on what we were up to that year). Once we hit our stride here in Madrid, we decided to initiate the next phase of our blog – consistently writing at least one post a week. Over time, we began to put more work into this blog as we got more and more feedback about how helpful our articles were. We started getting traffic to certain posts without even trying because we had written informative articles on topics that hadn’t yet been well covered on the Internet. Sharing our stories and the things we’d learned along the way came naturally as we enjoy the process. We also found ourselves connecting with other travelers with similar passions, lifestyles, and goals. Blogging (and social media) have connected us with so many wonderful people that we would never have met otherwise. In June, we finally got to meet Laura and Tanbay of The Travelling Weasels. We’d been in touch for literally years and they visited us in Madrid in June, 2018. We even made a few videos with them for their YouTube Channel! Photo Cred: Travelling Weasels. It wasn’t until November of 2017 did we decide to financially invest in some tools to help us blog and learn more about blogging (thanks Black Friday sales!). Since then, we’ve become more strategic and saw our website traffic and income grow significantly. Gradually, an idea began to take shape as we began to see that with the right strategy, blogging could be a viable source of income for us. Being able to do something we love that also earns us a living? Count us in. However, there was a catch – blogging full time wasn’t something we could do based out of Spain (at least not this particular moment in time). Unlike all you lucky Europeans and Brits (for now), as Americans, we need a visa to stay in Spain. The main ways that Americans reside are as follows: through an English teaching program like the Conversation Assistant Program (which Veren did for the past 2 years), getting a normal work visa tied to a full time job (notoriously difficult to get), getting domestically partnered to a Spaniard (damn it, we’re both American, so no luck there), or a non-lucrative residency visa based on proving a certain amount of savings to support yourself (usually around 25-30K, an amount we don’t have). We’re not alone in the dilemma of trying to find personal and/or professional fulfillment as expats in Spain. It’s a familiar struggle and one that we’ve discussed countless times with fellow expats, especially other Americans without working permissions. 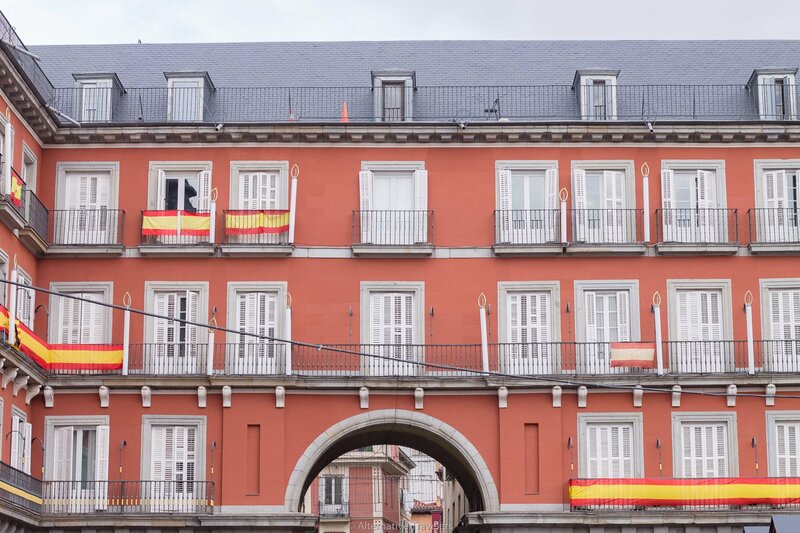 Even if we wanted to find full-time jobs in Madrid, we’d be mostly limited to teaching, and even then, most academies prefer to hire Europeans that already have working rights in Spain. We’d much rather menú in one of our favorite plazas (Plaza Paja pictured here) than sort out this visa nonsense. The easiest way for us to stay in Spain would be for Veren to keep teaching, but that’d mean not a lot of time to work on building our blog. The fact is, we don’t want to work for anyone else, especially not when we see a viable and exciting alternative. We want to grow our own business (through this blog). We’ve been working like crazy the past six months to get our book, Madrid Vegan Guidebook, which came out in mid-June, 2018. We knew that pace, along with our jobs, wasn’t sustainable. This barely allowed free time to enjoy anything while we worked nights and weekends. While we’re super proud of the final product, we knew it wasn’t a work-life balance we wanted to keep up. Sure, we could have stayed and kept working at a slower pace, but that would just be delaying what we could easily do sooner, without living the night and weekend hustle. With house sitting, we reduce our overhead significantly (no rent to pay), AND explore cool new places at our preferred slow travel pace. At most, house sitting is a quarter-time job (in terms of work hours) that we both split. We can vamp up working on our blog and still enjoy our lives without getting burnt out, as we have more flexibility with our work hours. Sam is already location independent, so with both of us earning an income online, we’ll truly be free agents. Taking a dog for a walk tends to be the most immediately time demanding in house sitting. House sitting also makes our material life more practical. All our necessities fit into two bags for each person. When you own things, you have to put time into taking care of these things. The more you own, the more time you have to put in. And so on. For us, being able to fit and carry our physical life in a backpack or two is liberating. It’s easier than you think and provides a gratifyingly simpler day to day life. Although it’s not an overnight process – for more, check out our posts: Eco-Friendly Travel Gear and Our Mobile Kitchen. Before moving to Spain, we house sat in the U.S. full-time for around 6 months (4 months in Salt Lake City, and 2 months in the NYC area), so this is a way of life that we’ve already tried and worked well for us. We’ve built up our references to the point where we land a majority of the house sits that we apply for. (We use TrustedHousesitters for all of our sits – read our TrustedHousesitters review for more info). We love the house sitting lifestyle and can’t wait to get back to it. Full-time house sitting means we can also spend more time with the people we love because we aren’t tied to school holidays (like with Veren’s English teaching job). If you didn’t already know, we’re originally from New York City. Most of our family and long-term friends still insist on living there (they’re a stubborn bunch). We have no plans to move back to New York City any time soon (or ever) but we do want to spend more time back there to see all our loved ones. We spent a couple of weeks over the 2017 holidays in New York with family and friends, time which only reiterated that two weeks a year just isn’t enough to spend with those you love. We’ve had many friends and family who have come to visit us in Madrid, and we appreciate that. Still, there are many family and friends who cannot or don’t want to travel, and visiting NYC means we get to see a bunch of people we love in one trip. One might say – if you miss them so much, then go back! Easier said than done. New York City is one of the most expensive places in the world (worldwide it’s top ten and in the USA usually number one). The cost of living is insane, and we wouldn’t be able to continue to work on our blog while living there. Most people are stuck in the grind, and it’s typical to go months without seeing friends and family because of the busy trap. New York demands a price we are no longer willing nor able to pay. Read more in Veren’s article: New York Glorifies Personhood but Does Not Prioritize People. If we release ourselves from a lease and location-tied job, we can act as free-flying agents and ideally spend a few months a year in the New York City area. Within that time, we are much more flexible to accommodate our friends’ schedules. Arguably we have spent more time with our friends when we see them traveling, as they are either taking time off that usually goes unused, or we can go out of our way to see them between gigs. It seems counterintuitive, but as free-flying-fulltime-house-sitting-slow-travel-agents, we’ll have more time and energy to be more purely present with the people we adore and love. Slow travel means our friends and family are part of our travels! Even some of our favorite Madrid friends may leave too (don’t worry, we won’t blow your spot), and we’ll want the freedom to travel to their new homes! We both grew up with pets. For most of our lives, there was a feline friend or two with whom we cohabited. There’s certainly a life-enhancing joy to be around animals whose life priority is to relax and enjoy themselves, rather than plug away at an endless grind of busyness that certain hominids stubbornly and ceaselessly continue (yes we’re still ripping on NYC). Sherri – one of our recent house sitting charges! Being entrusted with other people’s pets and homes definitely give us a sense of helpfulness, and we love contributing to an economy based on sharing and exchanging resources (i.e., a home for pet care). Ultimately this sharing model has allowed us to do a different sort of travel – we don’t call ourselves the Alternative Travelers for nothing. Madrid is a fantastic place that has played an integral role in our life these last couple of years. That after the first year, we chose to stay another year, says a lot about the place. We haven’t been interested in doing that anywhere else – yet. We love Madrid, and living there was great when it aligned with our goals. Now it’s time to realign our lifestyle to match these new goals, and leaving Madrid (for now) lets us do exactly this. If we stayed, we would be putting all our ambitions on hold. Still, our departure is definitely bittersweet as Madrid has become a second home to us. We’ll certainly miss many things about living in Spain, like the affordable lunch menú del día and the generally delicious vegan food, gorgeous weather, great public transportation, and of course, all the wonderful and inspiring people we met there. To all our Madrid community – thanks so much for the love and support. We’ll be back sooner than you think.